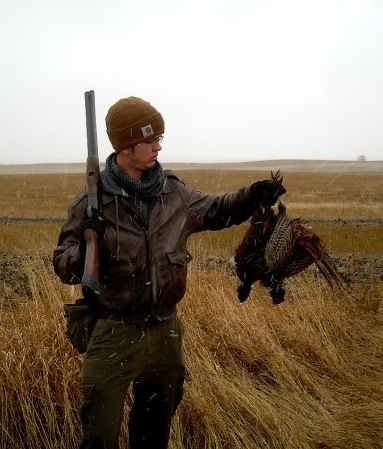 Some years ago I decided to take up bird hunting for this main reason: if I was going to purchase saran-wrapped chicken legs, thighs and breasts in the refrigerator section of the grocery store, I thought it was more respectful to at least experience what it was like to kill wildlife — in this case pheasant, doves and grouse — for the purpose of feeding family, friends and myself. This decision required me to purchase a bird gun (in my case, I bought a double-barrel, side-by-side 12-gauge shotgun), shotgun shells, and the necessary hunting permits. Since then I have hunted with at least four friends, including Rod Austin (accompanied by Grizzly, his beagle), Tayo Basquiat, Ed Stine, and Bob Shannon. After identifying suitable areas to hunt (in ND, PLOTs land provides excellent public hunting grounds), walking several miles, spooking pheasant from the brush, identifying the roosters from the hens, and then downing a rooster, one of the first impressions I had (and I’m presuming I’m not the only one here) in picking up a recently-killed pheasant rooster was the warmth. This stands in contrast to the cold feel of a saran-wrapped chicken breast in the grocery store, or the increasingly ubiquitous appetizer called “bone-in” and “boneless” chicken wings (culturally, we shovel these into our mouths, kind of on autopilot, as we watch the 37 flat-screen televisions broadcast UFC fights and sporting events, and as additional juke box and video game machines drown out any kind of conversation that could have been had in our drinking warehouses throughout America). A local plate of food. Slices of bison (medium-rare) from south-central North Dakota, this topped with a sauté of locally-harvested morel mushrooms. 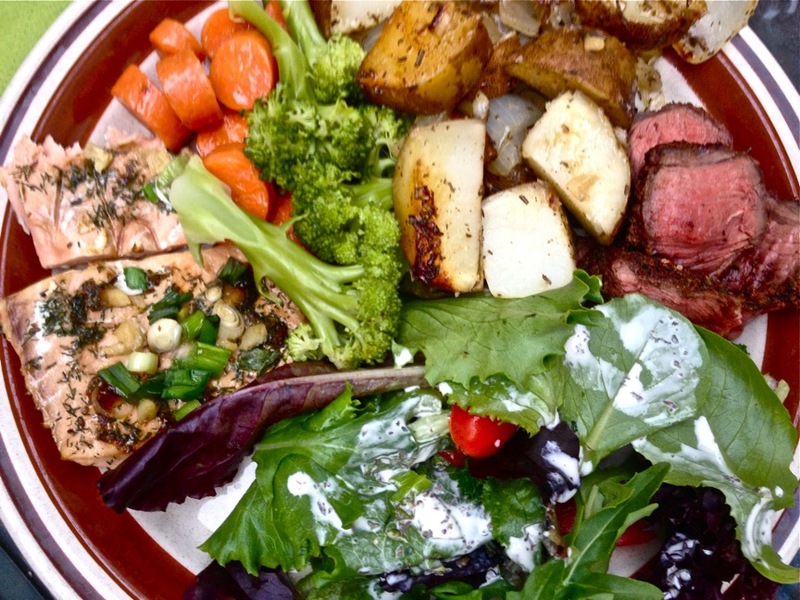 The origin of the salmon is unknown, but comes from Valley Meats in Valley City, North Dakota. The remaining vegetables were organic, or from what I call historic farming practices. No doubt, authors such as Michael Pollan have tapped into a growing social structure that concerns itself with the technics of how and philosophies of why food is produced. As an observer of this growing movement, international and local journals have also turned attention to reporting on these stories. Or at least the stories that involve individuals who want to know where their food comes from. These groups are bringing attention to multi-national corporations, and the stories have been picked up by The New York Times, CNN and, locally, WDAY News in the Red River Valley of North Dakota and Minnesota. In this latter story, the reporter focused on something North Dakotans are very aware of: heritage. This heritage is in turn used to consider how our grandparents and great grandparents produced food on family farms in contrast to how the Agricultural Industrial Complex produces food today. I remember when I was 10 or 11 years old (or thereabouts) in the kitchen of my late Grandma Barth. She had just sliced up a tomato, and in putting it on the table in front of me she said, “Here is a tomato, although they probably gassed it just a couple days ago.” My grandmother was communicating something to me that has been lost (and what I’m trying to recover by hunting): a connection with the land, and the landscape, and the food we eat that comes from that land. Although she didn’t say it directly, she was also concerned with what a gassed tomato (which is how the Agricultural Industrial Complex turns a green tomato into a red-colored tomato to simulate ripeness) might do to physiological early childhood development of her grandchildren. Another note: North Dakota legislators recently said it was okay for individuals to purchase unpasteurized or raw milk, so long as they owned a share in the cow. Below is the local WDAY story, and also the CNN story too. The WDAY story, which won’t imbed for some reason, so you have to just click on this link here. This entry was posted on Tuesday, June 4th, 2013 at 12:33 pm	and tagged with Agriculture, Archaeology, Archaeology of Food, Gardening, Hunting, North Dakota, Punk Archaeology and posted in Uncategorized. You can follow any responses to this entry through the RSS 2.0 feed.